If you've ever mowed a lawn, you have probably broken a sprinkler head or two. I know I have. When I was 10, my friend and I mowed lawns during the summer to fund our weekly bike rides to the nearby gas station where we would blow our money on Big League Chew and other concessions. I remember vividly, one Saturday, whilst mowing a client's lawn, I ran over a sprinkler head and shattered it to pieces. Unfortunately, that was not the last sprinkler head I would accidentally break. While one broken sprinkler head every once in a while is tolerable, there are situations where a sprinkler system has almost literally been designed for disaster and broken sprinkler heads seem inevitable. That's where the Sprinkler Buddy comes in. With the Sprinkler Buddy, you can have a peace of mind knowing that your sprinklers are not going to get run over by your lawn mower. This, among other things, is why I find the Sprinkler Buddy to be so brilliantly engineered. More of that in a minute! Because this is your GO TO Sprinkler Blog [wink, wink], I thought it would be beneficial for me to share this exciting product with you. The Sprinkler Buddy was invented by a man by the name of Leo. I got to talking to Leo and he agreed to put a little article together just for me [and you]! So, without further ado, please welcome Sprinkler Juice's very first Guest Blog Post! I hope you enjoy it. What separates this product from similar products found on the market today is its patented insert design combined with the flexible material that is used in manufacturing this product. The Sprinkler Buddy allows the users to determine their own perfect fit no matter which rotors or spray heads one may prefer. Having the ability to custom fit this product to your sprinkler head is what keeps the sprinkler heads visible long term with little or no maintenance. The perfect fit that one is able to obtain around the sprinkler head shaft using the Sprinkler Buddy is what prevents grass from growing between the sprinkler head and the Indicator/guard or Sprinkler Buddy itself. 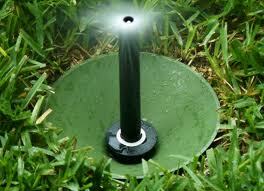 It creates a full seven inch diameter around the sprinkler head where grass can’t take root. The insert design also allows water to drain out of the Sprinkler Buddy when it’s installed. If you would like to learn more about the Sprinkler Buddy, visit us Our Website. You may also contact us via e-mail at our website as well if you should have any questions. 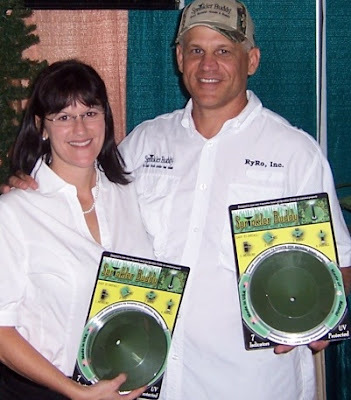 I would also like to thank this blog for allowing RyRo, Inc. to be a guest and share our new product “Sprinkler Buddy”. Leo D. Gauthier, III, Pres.